Once it became clear that the September target for obtaining an MOT would be missed (albeit with a stripped out interior), the pressure was off. With the cold, dark days of winter setting in, holidays in warmer climes became preferable to working on the car and so the momentum lost. The new target being the spring, once the last traces of road salt have gone. Just in time to sort out any niggles and put a few miles on the clock … before a mooted caper to the Monaco Grand Prix. It would be a fitting inaugural tour! Apart from the lack of trim, the car appears to be nearing completion. However looks are deceiving and the ‘To Do’ list is still alarmingly long. So I’ve got to get cracking! I’ve not been looking forward to installing the trim as it’s notoriously fiddly and something I’ve not tackled before. It’s the part everyone sees so it has to be done well. After all the effort so far, a poor job would not suffice! Further procrastination was required under the guise of trim planning …. I’ve decided it was best to leave the fitting of the hood and tonneau cover to the experts, Suffolk & Turley, who supplied the trim kit. Finally, once the car is returned, I’ll fit the door cards and boot trim. New door rubbers were obtained from SNG Barratt. However I wasn’t happy with the A-post and sill seals as, not only were their cross-section profiles noticeably larger than the originals, they were made of a much harder foam rubber. 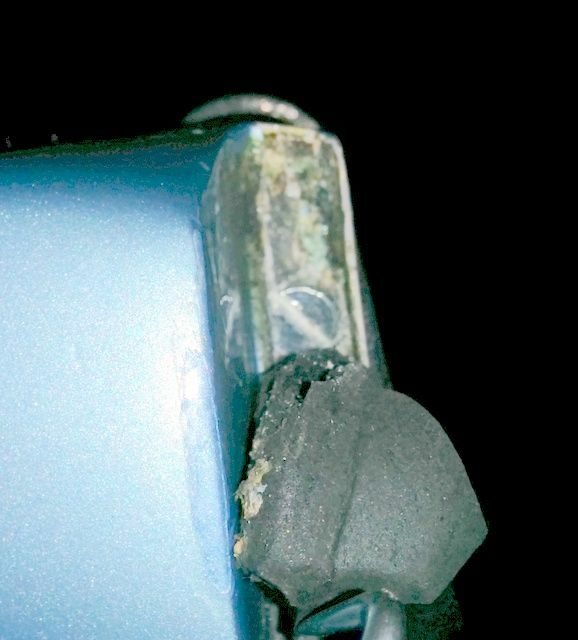 Other owners have posted issues with poor quality seals leading to ill-fitting doors which need slamming just to get the door to latch. The general consensus on the E-Type forum is to source all the rubber seals from COH Baines so a new set of door seals was duly ordered. I would thoroughly recommend doing so as they are much closer to the originals and made from a softer foam. I believe SNG Barratt have subsequently started to source many of their seals from COH Baines. Hutsons had pre-fitted the doors to the bodyshell, so the door strikers and locks were correctly set and panel gaps were all spot on. However the fitting of the A-post seal requires the door to be removed to provide sufficient access. So the outline of the door hinge was marked out with masking tape to aid re-fitting. Before removing the door, the A-post seal was trial fitted by taping it in place. Adjustments were made until the door could be closed easily without too much resistance. Some trimming of the seal was needed where it has a protrusion at the base of the A-post. Initially I had cut the seal exactly to length but the door felt a little hard to close. It is rather subjective at this stage, without the resistance of the other seals. I wanted to keep the additional force needed to compress the A-post rubber to a minimum. Being nearest the hinge, it requires considerably less force to compress this seal so any noticeable increase now would be magnified once the B-post seal is fitted. Being made of a softer foam allowed it to be cut marginally shorter and then stretched to reduce its cross-section, therefore reducing the resistance. Once I was happy with the fit, it was time to remove the door to bond the seal in place with the Alphabond AF178 high temperature contact adhesive I’d used for the Koolmat. I found it easier to tackle the A-post seals in two stages: first from the triangular section at the base of the A-post up to the top of the A-post and then the lower section down to the sill. For the lower section, I inserted a small diameter rubber hose into the gap in the rubber seal before securing it with masking tape. This worked really well in holding the rubber against the sides of the channel until the adhesive had dried. Everything was held in place for 24 hours with masking tape and then any excess adhesive removed. First softened with a cloth soaked in white spirit and then carefully wiped away. There were some areas where the adhesive had lifted away from the paint work so these required some touching up and re-bonding. Another tip I was given was to use Dum-Dum style body putty to fill any small holes or gaps. Previous hanging of doors had been a frustrating and fiddly experience so I only wanted to do it once. The weight of the various internal door mechanisms is not insignificant. So I wanted to have the doors at their full weight before setting all the panel gaps, thus avoiding the risk of them dropping by adding them later. The doors were refitted to their marked positions and the door internals completed (see below). Only then could the fine adjustments be made to get the panel gaps right. As would be expected, the doors had dropped slightly under the additional weight of the internal mechanisms and so the hinge position within the door had to be adjusted to compensate. A trolley jack was used in place of a suitable assistant to support the door while fine tuning the panel gaps. I could then move on to the B-post seals, which were tackled in the same manner as the A-post seals. Although these were fitted in one go and needed the bonded edge to be sanded down in places to enable the door to close without undue force. Hopefully, once the final sill seals are added, the doors will still shut easily. If not, it might be a case of re-doing all the rubber seals and re-hanging the doors! Finally the bonnet landing rubber was bonded in place while the adhesive was out. It was also more manageable by tackling this in two stages. The next task was to complete the fitting of the door internals and drop glass. The initial fitting of the frames produced very different results. The frame on the driver’s side was fairly close and possibly needed a shim added at the rear to bring the leading edge parallel with the A-post. The passenger side was way off! The leading edge was angling away from the A-post, by approx. 6-7mm at the top, and this was with the rear of the frame raised by two thick shims. Something was wrong! However it wasn’t the case for the passenger side! Suspicion fell on the geometry of the window frame, which had been re-chromed. The re-chroming process involves polishing the underlying plating before the chrome layer is applied. This can cause distortion due a combination of the pressure applied to polish the part and the resulting heat that is generated. Sure enough, when I tried to fit the drop glass, the regulator channel the glass sits in would not fit into the frame. It was too long, front to rear. I then used the driver side drop glass as a comparison – it’s length fitted fine! Much head scratching ensued … it must be the reproduction regulator channel. Overlaying the two revealed the problem. The angle of the rear of the regulator channel was way off on the passenger side. After much cursing of reproduction parts (that enable us to keep these cars on the road! ), I set about removing the glass from the regulator channel. Gentle prising with a screwdriver would only end in tears as the rubber grips the glass very well. Fortunately a small amount of penetrating oil worked wonders and the glass came out surprisingly easily. The rear edge was bent into the correct alignment and the glass and rubber re-fitted. Longitudinally it now fitted the frame. Alas the same couldn’t be said for the width. The leading edge of the glass sits in a flock lined rubber channel. While at the rear, the short trailing edge of the regulator channel sides metal on metal in the window frame. The width of the repro ones were too wide. Both regulator channels required a fair amount of filing to reduce their width so they slid easily within their channels. It was only once I started filing that I realised the rear section was made of brass but had then been zinc plated. When I had first fitted them I had cursed the fact that the reproduction parts hadn’t used brass, as in the originals! Once they slid easily within their channels, I decided to polish both the regulator channels and the window frames to reduce future binding problems. Some Shin-Etsu Silicone Grease will be applied to the seals and mechanisms before the door cards are fitted. Attention returned to the passenger side window frame as the glass did not slide cleanly all the way down. The reason was found to be cause by the chromed leading edge of the window frame being bent out of alignment – both rearwards and outwards! Fortunately gentle persuasion allowed it to be re-bent close to its original shape. I thought this would be the end of my window woes. How wrong could I be! The flock lined front channel comes in two sizes for 4.75mm and 6mm glass. I had the latter but, with the glass being a little shy of 5mm, it allows the window to rattle within the channel. However, the smaller size would cause binding issues. At this point I chuckled as I’d been in correspondence with the Jacksons whose E-Type refurbishment exploits have been covered in the E-type magazine. They had already experienced almost identical restoration issues, not just in the fitting the drop glass! But now I think I understood the issues they had encountered with the flock lined channel. I also purchased some lengths of thin rubber strips to pack one side of channel in the window frame before inserting the flock lined rubber alongside. This closes the channel slightly to guide the glass without causing it to bind or allowing it to rattle. The first task was to fit the door handles and then set the gap between the push button plunger and the lock/latch striker lever to 1/32”. This should ensure that the latch is fully released when the push button is pressed. Adjustments were made by slackening the lock nut on the plunger, adjusting the setscrew and then nipping up the lock nut. The fitting of the link between the door handle lever and lock requires the lever to be fixed in position. Aligning a hole in the lever with a hole in the rear casing allows a small Allen key to be inserted to lock the position. The link is then fixed to the handle lever. Its lower end has three overlapping, fittings holes and it is simply a matter of picking the best fit to the lock lever. The regulator springs had been removed prior to the regulators being plated and were showing signs of rusting. They were shot blasted and blackened with a four stage process supplied by Caswell UK. The process only takes approximately 30 minutes but the final stage requires the component to be dipped in oil and then left to dry overnight. I’m not convinced how durable this finish will be and its ability to stop future rusting so it will be packed with grease prior to fitting the door cards. With the springs fitted, the regulator could be inserted from above, followed by the two brackets to secure the bottom of the window frame to the base of the door. These brackets are moveable on their mounting stud so the lateral position of the top of the drop glass can be adjusted. These were only hand-tightened as they will need adjusting when the hood frame is trial fitted. I found it easiest to insert the window frame by first tilting it forward and inwards at the top until the front stud has cleared the door frame. It was then secured at the top in three places, where two screws pass through the window frame and door frame into a thin plate below. Shims can be added as required between the window frame and door frame to either raise the whole frame or tilt it so the frames leading edge is parallel with the A-post. The external glass weather strip needed to be clipped onto the door skin before inserting the drop glass because there wouldn’t be sufficient access once the glass was in place. (Update – I was jumping the gun here and had to remove it! I had forgotten to fit the chrome door flash so had incorrectly assumed the weather strip was attached to the lip of the door skin. I think it needs to be clipped to the lip of the chrome flash!) The window regulator needs to be raised to its maximum height in order to engage it with the drop glass channel. Next is the door remote control. Its link arm is attached to the door lock to enable the door to be opened by the interior lever. A wavy washer is fitted between the lock and the link arm to take up the free play. The square nuts fitted in the regulator channels set the maximum height of the windows but these will wait until the trial fitting of the hood. The doors were also fitted with a bracket that had a semi-circular foam section bonded to it. This is to dampen vibrations in the remote control link arm. Unfortunately these were missing on my car but once again RM & J Smith came to the rescue for obscure, missing parts. They had a pair of original brackets that would need tidying up and the foam replacing. Finding suitable replacement foam was not an easy task! Eventually I found Seals+Direct who offered a 1” diameter 1/2 round cord of expanded Neoprene (part ENHC94) which was ideal. Strips were bonded to the brackets with the Alfabond AF178 contact adhesive. The small aluminium seal blocks need to be fitted to the trailing edge of the doors before the door rubbers are trial fitted because these compress the upper part of the B-post seal. The last check was to ensure the height of the door frames against the A-post was even on both sides. The driver side was flush with the A-post cap while the passenger side was 1/8” lower. An equivalent depth of shims was added under the window frame edge to bring the frame up to the same level. Passenger side was 1/8” lower! What should have taken a day or two ended up taking well over a week! Next will be the refurbishing of the hood frame …. Update: a recent post in the ‘factory fit’ thread on the E-Type forum identified that the chrome bracket for mounting a hard top is secured at the top by a 12-28UNF cheese head screw. 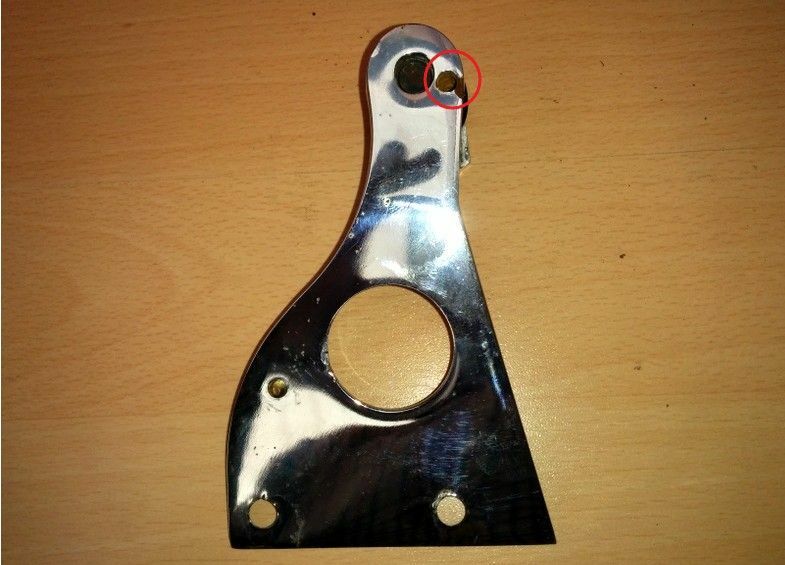 This screw passes through the channel for the B-post seal into the rear of the chrome bracket (circled in red below). Therefore the seal needs to be fitted after bracket and the bracket is fitted after the interior trim. I will therefore have to undo my fine work and detach the top 3″ or so, by softening the contact adhesive with white spirit, and re-attach once the interior trim is completed.